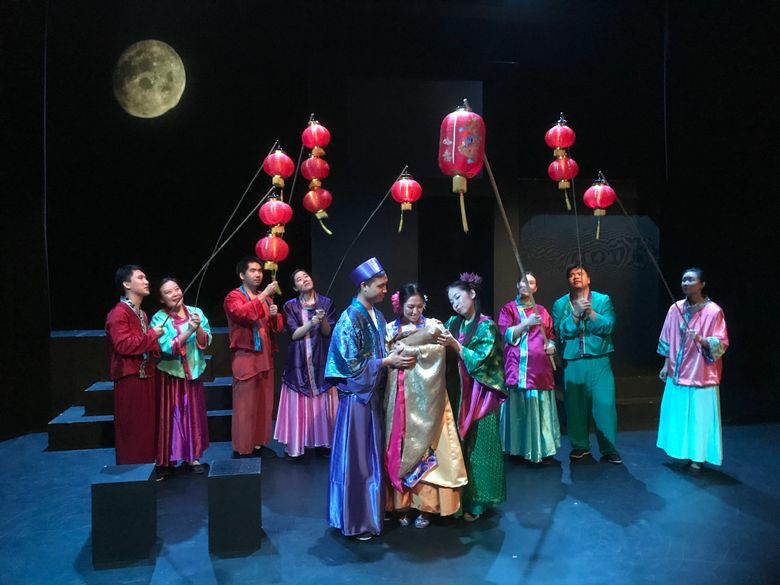 Mary Zimmerman's “The White Snake,” based on a Chinese folk tale, is brought to Seattle for the first time by ReAct Theatre, which celebrates its 25th anniversary this year. We all have secrets. And when captive to love, we all have a part of ourselves that we hide away, afraid it is inherently unlovable. 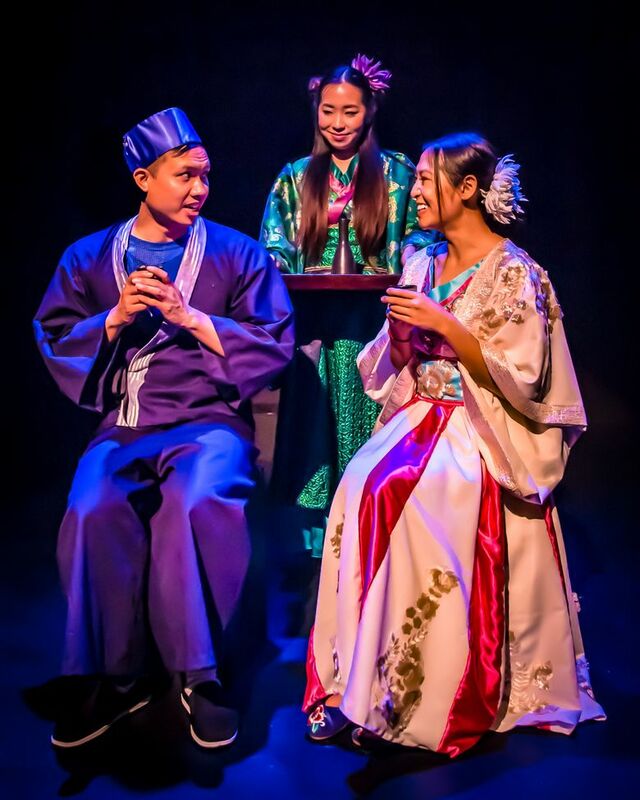 This is the issue at the center of “The White Snake,” a play brought to Seattle for the first time by ReAct Theatre, which celebrates its 25th anniversary this year, helmed by founding artistic director David Hsieh. “The White Snake” is based on a Chinese folk tale, the script adapted by Tony Award-winning playwright Mary Zimmerman, whose muses are Shakespeare and fairy tales. The story of “The White Snake,” basically, is this: A noble white snake (aka Lady Bai) and her faithful companion/BFF green snake Greenie — supernatural spirits both — have spent eons up a sacred mountain learning the way of the Tao. But before they finally transcend the material world for the bliss of true enlightenment, they decide to go down the mountain for a day transformed into pretty young girls for a little bit of reptilian rumspringa. And as inevitably happens when you’re on vacation, Lady Bai falls for a handsome young man in the service industry and then literally makes it rain so that he will lend her his umbrella. Interspecies love blossoms, and with Greenie as the quintessential go-between, Lady Bai gets her man. She then uses her magic arts to help him open the city’s best pharmacy and make his fortune. Trouble comes in the form of a misogynistic Buddhist monk with annoyingly omniscient knowledge who knows of Lady Bai’s true nature and is determined, for some reason, to tell on her and save her husband from the fate of having a snake for a wife, regardless of how good she is at business. Zimmerman’s spirited (and surprisingly funny) script gives earthly grounding to a folk tale that sometimes comes off a bit unwieldy, what with all the transformations and arbitrarily unhelpful demons, and highlights the tension inherent in any relationship: the fear that we will be rejected if we reveal what we truly are. Funny interludes pop up just as the story seems in danger of becoming too cloying, like the occasional self-referential nod to the highly choreographed movements of Peking Opera and intermittent musical numbers, keeping things playful even as the story descends into drama. Zimmerman’s play, which is smart enough for grownups and animated enough for children, is also both feminist and slyly anti-establishment, or at least anti-Buddhist — we spend the play rooting for the snake girls and the dopey husband to get over that whole “nirvana” idea and fully embrace the joys of earthly attachment (in “The White Snake,” Zimmerman plays fast and loose with the differences between Taoism and Buddhism). ReAct’s production is a pocket-size version of the original Zimmerman-directed show commissioned by the Oregon Shakespeare Festival in 2012, and maintains the elegant essentials of giant snake puppets, shadow boxes, glowing paper parasols and minimalist landscapes rendered in flowing silk, while being unashamedly and humorously aware of its lower budget. The all-Asian-American cast winds you slowly into their domestic drama, fairy-tale-scale troubles (Immortality! Transformation! Magic!) rendered emotionally real. Anna Saephan as White Snake is virtuous without being a Mary Sue character, and Henry Vu as her gullible beloved manages to play the fool with dignity. But Yena Han as Greenie steals the show, alternately funny and pugnacious (sometimes both), her facial expressions and comic timing alone are worth the price of admission, holding the fuzzy fairy-tale logic of the plot together. Frankly, the most unbelievable thing is that a transcendent immortal snake goddess who can control the weather would fall for a pathologically gullible (if cute) assistant pharmacist. But it happens often enough in real life, so perhaps in “The White Snake,” we can see, played out in silk and shadow, how we can accept absolutely anything if we’re truly in love.